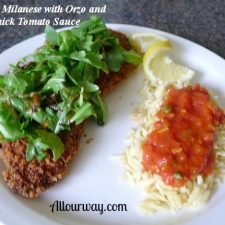 An easy meal like Chicken Milanese with orzo and quick tomato sauce tastes like I spent all day in the kitchen preparing it. 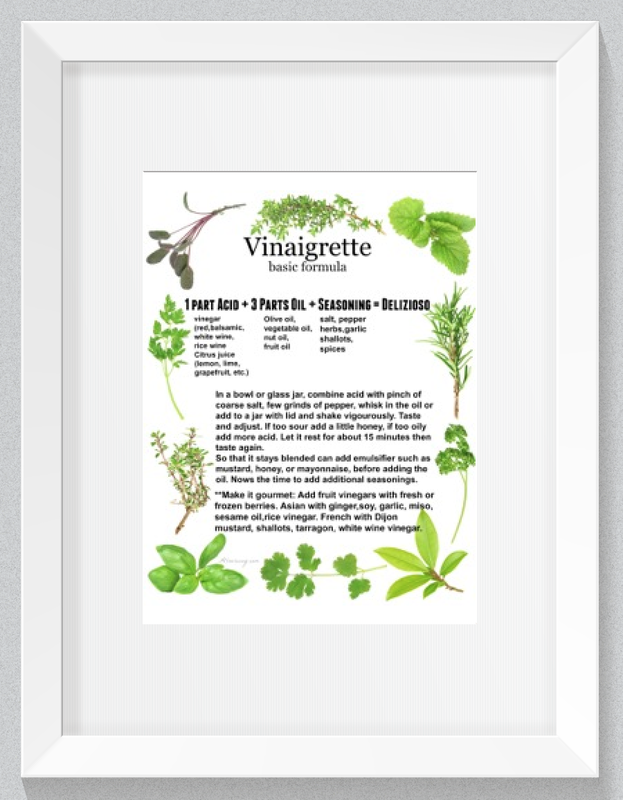 It’s always nice to have some old reliable recipes I can fall back on especially when I know my Honey and I will be busy working outside in the yard all day. Now, I know that an original Chicken Milanese recipe does not call for panko, Asian bread crumbs, but we like how the panko crumbs keep their crunch. Even after the chicken gets cold, they keep that crunch, plus now I’ve found Italian blend panko crumbs at the grocery store. So, before I go outside to start on the yard work, I flatten the chicken breasts for the Chicken Milanese like I did for the Chicken Francese . . . sprinkle them with some kosher salt and pepper then cover them with plastic wrap and back they go into the fridge. Smooth side of Mallet to Flatten Chicken. Then, I get the Quick Tomato Sauce started. That’s just a matter of throwing the ingredients into a saucepan, smushing the whole tomatoes and letting it all simmer for a bit. The sauce is now ready to dress the orzo. The orzo I make as I’m making the chicken and I just follow the box directions. The fresh greens that will dress the Chicken Milanese will be the Arugula with Roasted Leeks and Mushrooms. Leeks are really easy to clean if you follow the method I mentioned in the Arugula recipe. I try to buy the organic arugula that has been tripled washed. I clean the mushrooms and leeks in the morning. When I come in, I follow the recipe. So, all that’s left to do, basically, is throw the recipes together. It really doesn’t take too long. 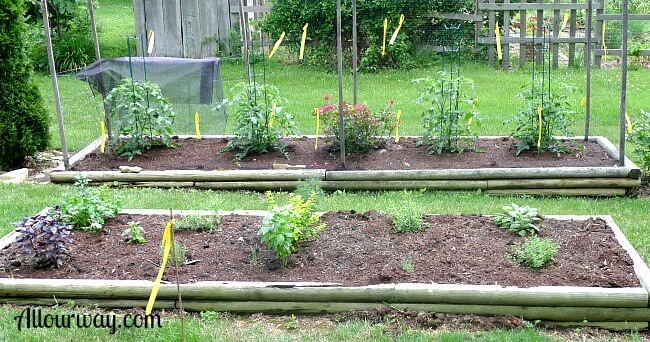 Who wants to spend a lot of time in the kitchen preparing dinner when you’ve been outdoors working all day in the yard? Or for that matter it could be that you’ve been shopping all day, enjoying time with the kids or just busy with all things we try to catch up on. 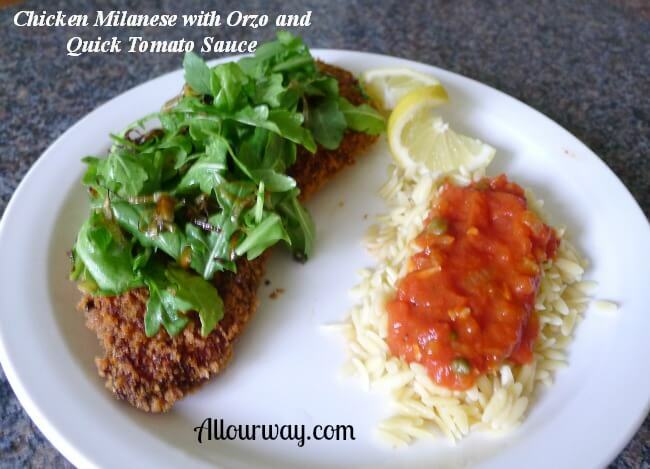 If this describes you, the Chicken Milanese with Orzo and Quick Tomato Sauce recipe is for you. 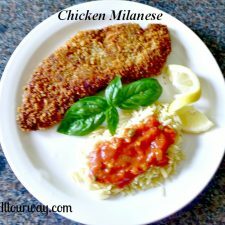 A variation of the usual Chicken Milanese recipe using Italian seasoned panko crumbs and dipping it in buttermilk. The result is a very crunchy coating that keeps its crunch even when the chicken is cold. 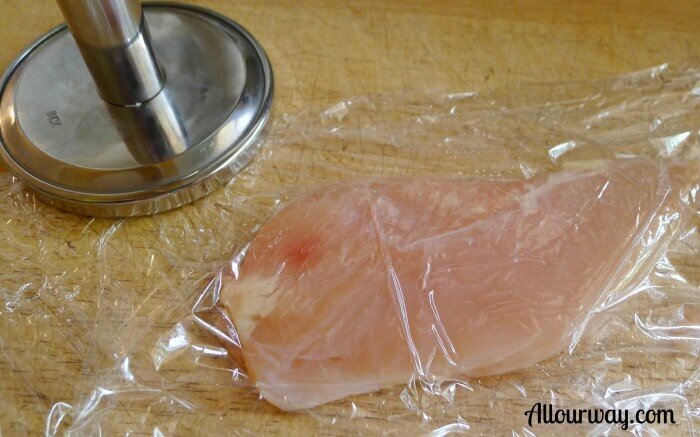 Clean the chicken breasts and place each one between two pieces of plastic wrap and spray the chicken with a little bit of water -- this makes the chicken flatten easier without tearing. Using the flat side of the meat mallet pound the chicken until it is about 1/4-inch thick. Salt and pepper on both sides. This step can be done ahead of time. Put the chicken back in fridge if not continuing with the breading. Set up a breading station by putting the flour in a plastic bag, the buttermilk in a shallow dish , and the panko/ Parmesan mixture on a piece of wax paper. Coat each breast first with flour, then dip into the buttermilk-- letting excess drip back into the dish , and finally put the breast in the breadcrumbs, pressing the breadcrumbs into the chicken so that the breast is thoroughly coated. Put the finished breast on a wire rack over a baking sheet. Repeat the breading process with the remaining breasts. In a large cast iron skillet ( 12 inch) or saute pan, add about 1/4 inch of peanut oil. Heat the oil over medium heat. Test the oil by dipping a corner of the breaded chicken into the pan. The oil should sizzle immediately -- don't get too anxious -- if it doesn't sizzle just give it a little more time. Once it's ready put two breasts in at a time. Cook them for several minutes on one side -- until they're a golden color, then carefully flip them and continue cooking until the second side is golden and fully cooked. Transfer the cooked breasts to the paper-lined baking sheet and keep them warm in the oven. Continue with the remaining two breasts and once they're done transfer them to the paper-lined baking sheet and keep warm in the oven. When you're ready to dish the plate, top with your choice of baby salad greens and dressing made your way. When I start on the Chicken Milanese, I start on the water for the orzo. The Quick Tomato Sauce is already made so it will only take the orzo about 8 minutes to get al dente. I roasted the mushrooms and leeks in the oven as I prepare the Chicken and keep the vegetables warm until ready to add to the arugula. A tomato sauce that is quick and easy to make but tastes like you've spent the entire day slaving over the stove. In a medium size heavy pot, heat the oil over medium heat. Add the onion and garlic and saute until soft and translucent, about 3 minutes. Add the celery, carrot (optional) and season with salt and pepper. Saute until all the vegetables are soft, about 5 minutes. Add the tomatoes, rinsed capers, basil, and bay leaf. Smush the tomatoes with a wooden spoon. Simmer covered on low heat for about an hour or until thick. Remove the bay leaf and check for seasoning. To smooth out any type of acidic taste add 1 Tablespoon of the butter and mix until melted. Taste again and if you think it's needed add the other Tablespoon of butter. This should round out the flavors. If you have soffritto on hand you can skip the sauteing the onion, garlic, celery, carrot in the olive oil and add 1/2 cup soffritto. The reason the carrot is optional is because carrots sometimes have a tendency to make a sauce sweet -- it's your call. Wow, it looks absolutely delicious! 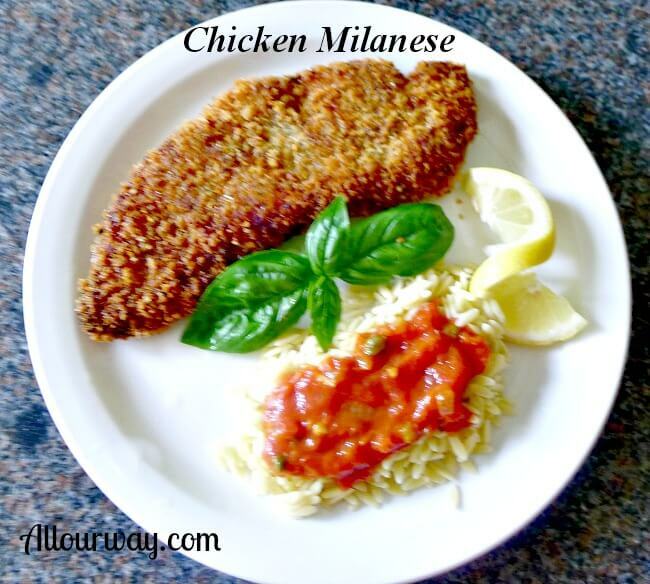 I’ve never made Chicken Milanese. I hope you try it– it is really tasty.